If you liked PINKS ALL OUT then you're going to Love ALL OUT Live! The producers of PINKS ALL OUT brings you ALL OUT Live. Heads up ALL OUT style racing is coming to Orlando Speed World. 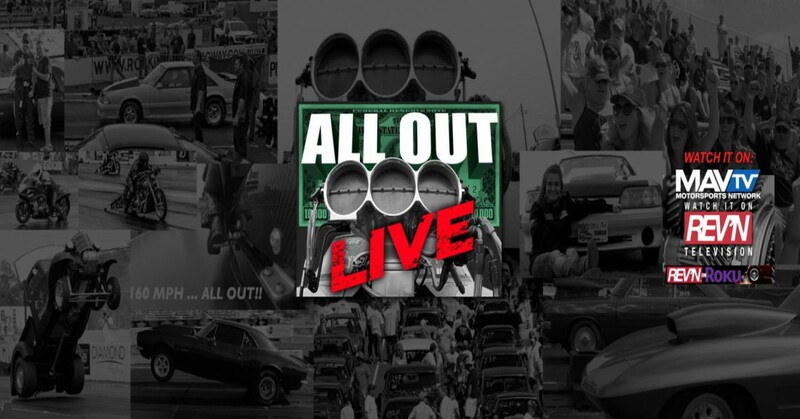 With multiple ALL OUT style ET race classes and new fan interactivity gives everyone in attendance more chances win prizes during a Live Taping of the show. The addition of our new segment THE CALL OUT brings some of the top grudge matches to ALL OUT Live events. Special CALL OUTS include USA racers that have appeared on the popular TV show Street Outlaws taking on some of Canada's baddest heads up racers in a USA vs Canada shootout. All events will be broadcast via Live Stream and recorded for broadcast and cable television on MAV TV, REVN TV and ROKU. We've added a special segment called THE CALL OUT®. Featured racers that have appeared on the popular TV shows and top race classes will be accepting Call Outs from local area racers. THE CALL OUT starts online and ends face to face in front of the ALL OUT Live fans. All events will be view-able online via Live Streaming, Roku and recorded for cable and broadcast television airings on MAV TV and REVN TV.